Dear Sir: I have to state that Jeptha Horton and myself purchased of William Smith (free colored) his tract of land (less than 100 acres) lying in the vicinity of Raleigh, and not long afterwards sold it to John Hutchins, of Wake county, who paid the purchase money, and received a proper deed for the same about the year 1853. The deed from Wm. 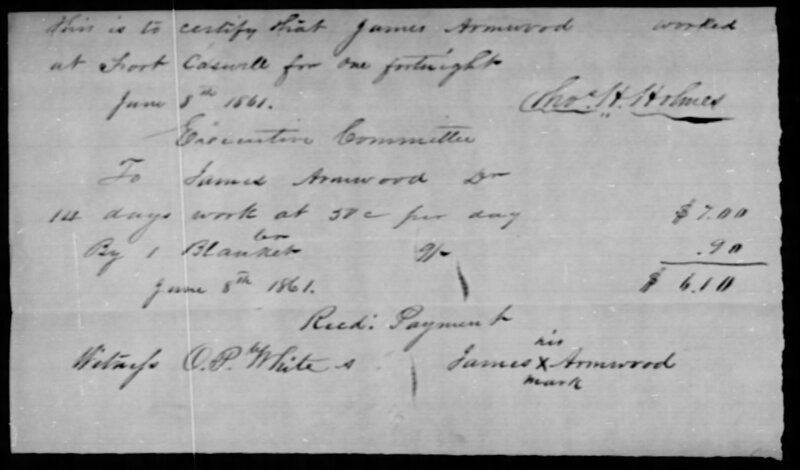 Smith, barber, to W.W. Vass and Jeptha Horton in fee, is registered and date February, 1853. Wm. 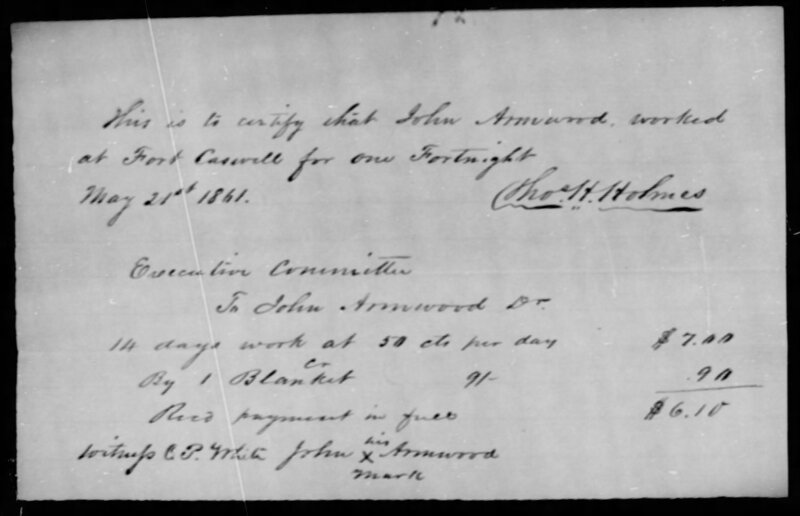 Smith bought of John Suggs in 1838 and 1826, as appears from the registry books. BATTLE & SONS. The Daily Standard (Raleigh), 27 May 1869. The Armwoods get certified and paid. During the Civil War, free men of color were conscripted to build breastworks on North Carolina’s southern coast. After filing claims, the Armwoods were paid for their two weeks of service — minus the cost of a furnished blanket. 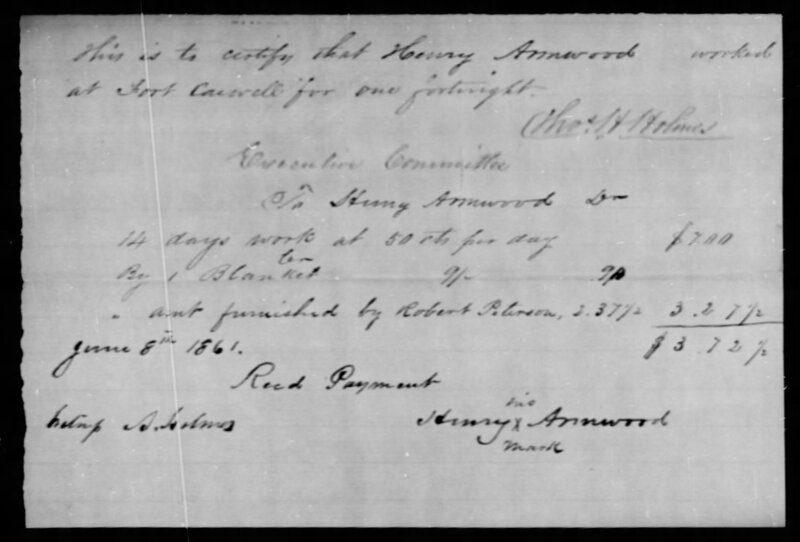 In the 1850 census of Southern District, Sampson County: John Armwood, 50, laborer; Susan, 30; Henderson, 25; Louisa, 20; Henry, 16; Richard, 15; and John Armwood, 13. In the Northern District: James Winn, 33; Buckner L.Bryan, 14; Zachariah Bryan, 13; and Owen Armwood, 24. It did not make a slave of Mills. John A. Philips v. Patrick Murphy, Adm’r, 49 NC 4 (1856). This action arose in Cumberland Superior Court. Concerning Hannah, a likely young handsome female with good qualities. The bond of Doctor Nesbitt and his letter to Mr Jonah Clark, (concerning a certain mulatto woman called Hannah, who formerly belonged to said Clark) having lately been put into my hands, and understanding that Dr Nesbitt still threatens to make another attempt to carry her off in a clandestine manner, I have thought proper to lay them before the public through the medium of the Wilmington Gazette. Know all men by these presents that I, Robert Nesbitt, of the State of South Carolina, Physician, am held and firmly bound to Jonah Clark, of North Carolina, planter, in the sum of four hundred pounds, current money of the state of North Carolina, for the payment of which sum to the said Jonah Clark, his heirs, executors, administrators or assigns, I, the said Robert Nesbitt, do hereby bind myself, my heirs, executors, and administrators firmly by these presents sealed with my seal and dated this 24th day of April, 1797. The condition of the above obligation is such, that whereas I, the said Robert Nesbitt, have purchased and possessed myself of a certain Mulatto Female slave, named Hannah, late the property of the said Clark, which said mulatto slave I, the said Nesbitt have agreed with the said Clark, to manumit and set free, free, whensoever he, the said Clark, or any person for him or his representatives, or any person for them shall pay, or cause to be paid to the said Nesbitt, the sum of three hundred and forty Spanish milled dollars, or in case of my death, to my representatives; now, therefore, if I, the said Robert Nesbitt, or my representatives, shall at any time after the date of these presents on application of said Clark or his representatives, and the payment by him or them as aforesaid, or the sum of three hundred and forty dollars aforesaid, manumit, emancipate and set free agreeably to law, the said mulatto slave Hannah, so that she shall not be thereafter subject to the control, or command, or debt, or demand of any person whatever as a slave. Then the above obligation to be void, otherwise to to remain and abide in full force and virtue. In witness whereof, the said Robert have hereunto set his hand and seal, the day and year aforesaid. It surprised me not a little at the return of my boy, without Hannah, after you had promised me so faithfully that she should be sent whenever called for, now after being with you near one twelve month, immediately upon sending for Hannah, down comes Sye with a letter from you mentioning Hannah’s unwillingness to come, likewise that Sye would deliver me three hundred and forty dollars at the same time, putting me in mind of justice and honor in the nature of the contract between yourself and me. Gods know if any justice or honor were thought of either by yourself or me when that penal bond was given you by me, as you well know I was obliged to do so, to get my property delivered to me by you — but again Sye never delivered this money as your letter to me specifies, no it is sent down to an Allston with a letter to them to see this business done and should I refuse to emancipate your daughter Hannah, to commence an action against me immediately for the recovery of the Penalty — but you were too fast, you thought you had things to your wishes, not knowing it was necessary that the wench must be down on the occasion as the law requires. I would notwithstanding have sent Hannah up for her cloths not Sye and being apprehensive of the consequence would not venture as you have deceived me more than once, you will deliver the clothes to my servant or cause them to be delivered at the request of Hannah and myself. You may conceive a great deal of honor in my penal bond, but there is really none except what the laws of my country will make me comply with, which is either to emancipate Hannah or pay the penalty of eight hundred dollars which when paid will be no more than four hundred and sixty out of my pocket, and believe me, should you push, and I expect nothing else and indeed it is my wish, will and shall exert myself to pay you in your own coin, that is, will endeavour to procure your antique mouldy papers wherever they may be procured either below or above the value, for am not a little irritated at your conduct after my handsome behaviour to you and yours. But on the contrary if you will leave it in my breast to emancipate, which I promise you I shall on these conditions — that she continue with me my life, I will return you the money that I have received from you by Mr Allston whatever intent it might have been given for. I wish you to consider the business maturely as it concerns Hannah’s welfare much, like consider if you have any bonds still out unpaid, if you have, be assured I will endeavour to purchase them, likewise consider what an enormous price negroes sell at in So. Carolina, a likely young handsome female with good qualities and disposition will bring a price extraordinary. I have been offered for Hannah 1290 by one 1730 dollars by another but Sir, that and twice as much more will not tempt me to part with her, unless am provoked and find it not safe to keep her (that is to say people of bad stamp should put notions in her head to abscond from me, which I am certain she will never do otherwise. However to come to a conclusion whatever has been said above is really from a candid mind, that never meant to injure you nor yours, but rather were it in my power would assist if occasion wanted and I request you to write me as candidly by my servant, whatever you think on the subject and what you wish to be at, whether you will accede to my proposals or what you first intended, am prepared for either, Hannah says she is satisfied with my offer. N.B. I have been just now inform in bringing the horse across the river to the main, he has got staked and he being the only horse I can spare, the other being rode down, Sye will deliver this to you, unless I change my mind. Send the clothes belonging to Hannah over to Mr Howes so that when my boy should come he may not be detained unnecessarily. Wilmington Gazette, 23 April 1805. [Sidenote: This is not, strictly speaking, a document about a free person of color, as I don’t know whether Hannah was ever emancipated. It is, however, a fascinating — and appalling — glimpse behind a curtain. Freedman’s Bank depositor, no. 4. No. 7110. Record for Jno. Artis. Date July 14, 1873. Where born: Wilmington. Where brought up: ditto. Residence: Corner Brunswic & 7th Sts. Age: 21. Complexion: dark. Occupation: carpenter for self. Wife: none. Children: None. Father: Elvin, dead. Mother: Lizzie. Brothers and sisters: Hildred, Eldred, Champ, Sylvester, Jane, Lizzie. /s/ John Artis. Freedman’s Bank Records, National Archives and Records Administration. In the 1850 census of Wilmington, New Hanover County: Elvin Artis, 37, “carpt,” wife Eliza, 22, and children E.A., 8, Champion, 6, Silvester, 4, twins Hildred and Eldred, 9 months, and John Henry, 17. Two tracts on Mumford Street. Washington Winn to Lewis W. Levy. 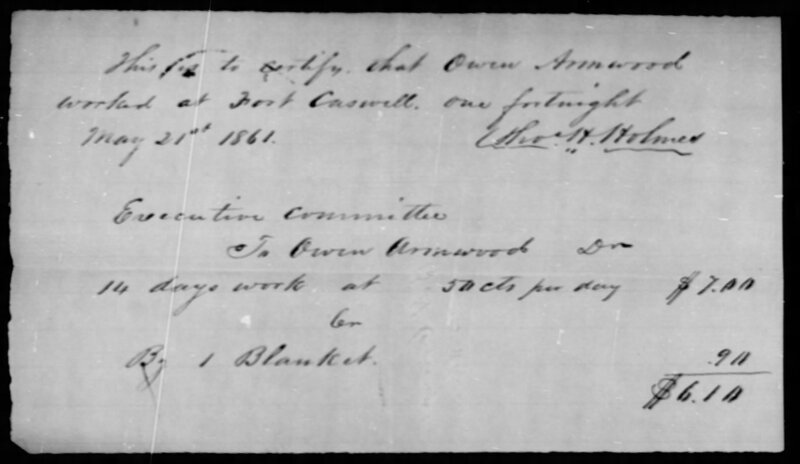 Grantee Book 51, p. 542, Register of Deeds Office, Cumberland County Courthouse, Fayettevllle. Freedman’s Bank depositor, no. 3. No. 3521. Record for James Crawford. Date April 21, 1873. Where born: New Bern. Where brought up: ditto. Residence: East Front Street. Age 29, September 15. Complexion: dark brown. Occupation: porter for J. and J.A. Patterson. Wife: Mary Noble, married August 1, 1872. Children: None. Father: Virgil Crawford, dead. Mother: Gatsey Dove. One half-brother: Virgil A. /s/ James Crawford.